Every time I visit Tokyo I see something new. Of course, it is the largest metropolitan area in the world so it would make sense that there is a lot to explore. The Japan Council of International Schools meets in different schools every year in Tokyo and it gives me a chance to see different areas. This week I spent the night in one of the richest and most exclusive residential and shopping districts in the city, Azuba and Roppongi. I was really curious to see the area because the American Chamber of Commerce in Japan (ACCJ) is always holding events there. There are many embassies and foreign residences in these suburbs. I arrived late on Monday evening after taking the shinkansen after school. It was an absolutely perfect night for a walk, with a fresh early autumn air and a clear night. I was staying in a small business hotel in Azabu and walked over to the Grand Hyatt Tokyo Roppongi Hills. There are hundreds of designer boutiques, high-end shopping stores, restaurants, etc. The mall is beautifully designed with gardens, nice views to the city, etc. I have been to Tokyo many times and the city still fascinates me. I didn’t have a lot of time to see the area because of work, but I did get to feel the swanky luxury of one of the most exclusive areas in the city. Farewell to Summer (Part I) – Summer Sonic 2018! Summer is my favorite time of the year. I experienced long, cold winters and cold wet springs and autumns growing up in pre-global warming northern Michigan. The brief respite of the “tropical trumpet” as ecologist Tim Flannery calls it, during July and August was such a respite from the usually inclement weather. It also coincides with school holidays and as a busy educator, I find summer a time to reconnect with myself and my family. As I am writing this on September 1, I am feeling a bit of melancholy and looking back at the peaceful and sweaty days of July and early August. I’ve been so busy with the start of the school year that I did not write much in August, so I am catching up with the end of our summer family activities. 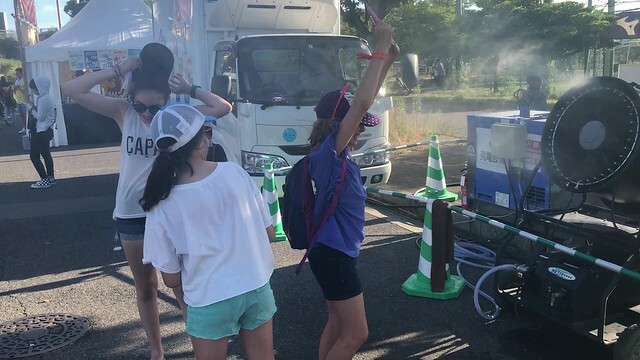 It was a super hot, humid glorious summer day so the water stations and air conditioning of the Sonic Stage, inside the Osaka Evassa basketball arena helped us keep cool. There were many highlights. Beck – I forgot how much I liked him and he was a true entertainer, providing a good 90 minutes of delightful music. It was the best overall performance. J Balvin is massive on the pop charts for his reggaeton/hip-hop style of music. I had never heard of him, but loved his more traditional Colombian cumbia and salsa-inspired songs. St. Vincent reminded me of Talking Heads and I loved her visual style and dance grooves in her music. Lots of energy from Walk the Moon and Portugal the Man. Both groups had huge pop hits, but I felt both really wanted to play arena rock and Metallica-like hard rock respectively instead. Ocean absolutely loved Alessia Cara, whose target audience I think is teenage girls. In between shows, we went to the food court/village and had some super greasy but delicious hamburgers. The concert was held in Maishima Sports Park, an artificial island in the port area of Osaka Bay. The professional baseball team Orix Buffaloes have a training grounds there and the professional basketball team Osaka Evassa’s arena is also located there. It was a distinctive place to hold a festival and despite the tens of thousands of people, it didn’t feel crowded at all. Japanese culture keeps things orderly and the need for security and seeing young people fighting, vomiting or causing havoc was not happening, thankfully. In the civilized section of the stadium! The highlight of the day was bonding with my daughter Ocean, my wife Nadia and our friends! What a great way as a father to spend time with a pre-teen girl! We will definitely go back next year if possible. Having two teenagers in the house keeps us “hip” to pop music and culture and keeps us young! The Itsukushima shrine on Miyajima Island is one of 18 United Nations Cultural Heritage sites in Japan. The Shinto shrine has an unusual Torii (gate) in the tidal bay that draws hundreds of tourists daily. Besides the gate and temple, the island is dramatically beautiful with sharply rising green hills and rocky outcrops. There are also breathtaking views of the islands of the Seto Inland Sea. After the Atomic Bomb Dome / Peace Park, it is the attraction to see in Hiroshima. It was a super hot day with temperatures close to 100 F. In my previous visits, we usually hike to the summit of Mount Misen, the highest point on the island, but instead took the cable car up to the top. The views did not disappoint, but we were ready to cool down after walking around at the top station. We stopped for ice cold Summer I.P.A. on tap at the Miyajima Brewery and they really hit the spot. Before leaving the island, we had to try the Hiroshima-style okonomiyaki. The four-hour drive back to Osaka went well. We recovered this weekend. It has been nice to have my uncle visit in this last week of summer holidays. I am not a big drinker but I do love the science behind fermentation and distillation. We visited the Suntory Yamazaki Whisky distillery in Kyoto on Wednesday. I recommend the tasting tour if you enjoy whiskey. Note that in Scotland and Japan, whisky is spelled without an “e” and in Ireland and America, we add the “e”. Whiskey comes from barley and after fermentation and distillation, it is a clear liquid. The distinctive color of whiskey comes from tannins in the storage barrels. The longer it stays in the barrel, the darker the color. Turning barley, water and yeast into whiskey only take a week, but aging in barrels can take up to 30 years. The elusive Yamazaki 18 Whisky was not available for sale. It is the crown jewel whiskey in the Suntory range of whiskeys. We hope to find a bottle for my uncle someday. I particularly liked the whiskey library on the premises. The researchers at the distillery try different methods and blends to come up with better tasting products. They also sample other whiskeys from around the world. Visitors can buy these test whiskeys and they come in really cool bottles. After lunch in a restaurant near the distillery, we went to a sake museum in Kyoto. After navigating the narrow streets of the city, we eventually arrived at the museum. Sake takes more processing than beer and wine and there were informative displays going through each step. The highlight was a sign that commemorated Babe Ruth’s visit to the brewery. Hiroshima is one of my favorite cities in Japan. It is the perfect size for a city, about 1 million people. Osaka, the city I live in, is a bit too big, but our suburb of Minoh is really nice. Hiroshima also is beautiful, surrounded by mountains and it has wider streets than most Japanese cities. This is my fourth visit to the city, twice for school business and twice with my family. Because of the history here, the beauty and the proximity to Osaka, it is an easy place to take guests and give them a taste of a different part of Japan. My uncle is visiting this week, our last of summer holidays, so we took drove the 4 hours from Osaka to Hiroshima this morning. 71 years ago Monday, US forces dropped “Little Boy” above what is now the Peace Memorial Park. Going through the museum is always emotional for me. Reading the stories and seeing the photos of the children killed by the blast is tough, especially as a father. Not only the 140,000 people dead is a tragedy, but the families of the 140,000 that survived. As I’ve written in the past, every world leader should come and visit the memorial. Hopefully, it will make them consider more the human toll behind ordering bombings. Today is the anniversary of the Nagasaki bombing, a city I hope to visit before leaving Japan and one that does not get recognized enough for what it suffered. It was so pleasant in the late afternoon sitting along the Motoyasu River that we spent several hours, just watching the river under the trees. That is one good thing to come from the nuclear bomb, a beautiful green park in the center of the city. Our relaxation came to an abrupt end when an unnamed member of our family (perhaps my spouse) dropped my iPhone 8+ into the river. Oliver climbed down the embankment and retrieved it in about a foot of water. We learned that the iPhone 8 is water resistant and when dropped in water for under 30 minutes and less than 1 meter, it should be OK, which so far, my phone has been fine. We are staying in an Air BnB apartment near the park. Nadia and I went for a drink at a local sports bar and watched the extra innings of the first place Hiroshima Carp against the Chunichi Dragons. The patrons were totally into the game and it was fun to watch the outcome of a replay challenge of a close play at first base. I am absolutely loving cycling through the Minoh Quasi National Park this summer. This morning I completed a 30 kilometer (18 mile) loop through Minoh and Ikeda. The highlight was the beauty of the Minogawa (Minoh River) reservoir. Using Strava, a cycling and running tracking app, you can see exactly how far you rode, your speed and the elevation profile. It feels like the Tour de France. I wish they had this when I was younger! It was very hot and humid today with temperatures in the high 90s. On the way back down the mountain, I got some gorgeous views of Ikeda and the Shin Inagawa Bridge. Cycling is so enjoyable and refreshing for me. I wish I could go every day!